Pet laser therapy is an exciting healing modality used by veterinarians to treat injuries, expedite surgical recoveries, and reduce pain. Also called photobiomodulation, laser therapy has been embraced as an effective, noninvasive, painless treatment option. Keep reading to learn more about this complement therapy and its benefits. 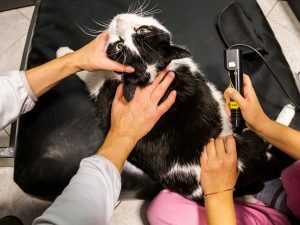 What is Pet Laser Therapy? Laser therapy is the use of wavelengths of light to stimulate cells and increase blood flow to a targeted area. This has many therapeutic benefits. As circulation is increased, so too are oxygen levels, endorphins, and nutrients, all of which aid in reducing inflammation and pain. It also promotes faster healing and recovery.